Nintendo of America has released new information on how Mario Party: The Top 100 supports amiibo on Nintendo 3DS. Compatible amiibo can be used to receive in-game bonuses such as coins and restoring lives. By using the Goomba or Koopa Troopa amiibo, players can unlock the Goomba Minigame Pack or the Koopa Troopa pack easily. 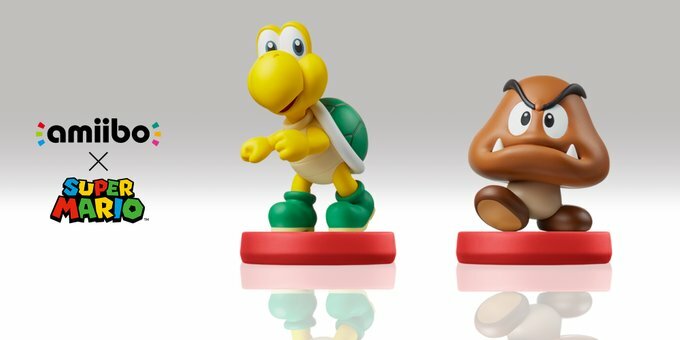 Tap compatible amiibo™ figures to receive in-game bonuses on Minigame Island. Stand on a circle marked with the amiibo symbol and tap to get 10 coins. If the amiibo circle is occupied by a Goomba or Koopa Troopa, tap their respective amiibo figures for 50 coins! If your life reaches 0, you can tap compatible amiibo to restore one life. Each compatible amiibo can be scanned once per day.Tap the Goomba or Koopa Troopa amiibo™ figures at the Minigame Pack selection screen in Minigame Match or Championship Battles for a shortcut to unlocking the Goomba Minigame Pack or the Koopa Troopa Pack.